While global space eliminates the geographical locations wherein these proposals take place by homogenizing them; technological appropriation is seen as a disagreement, and as such, artistic practices emerge as autonomous. How would our mindset allow us to recognize the facet of every appropriation? Which tendencies are generated through artistic practices taking place in technologically advanced countries, and which ones occur in those that are not? Where can critical thinking lead us in terms of planning, performance, production and exhibition of media art? Moreover, would this ultimately redefine such terms as “global” versus “local” where countries are interconnected through commercial, informational and technological links? By conceiving a platform where disagreement serves as our standpoint, we want to set off a series of events whereby we can discuss the implications and scope of this viewpoint in a variety of contexts. Thus, when we refer to a certain region (Latin America, Africa, Asia, Europe), we are not automatically thinking of the construction or remaking of identities, but rather, of a localized space that allows us to analyze the practices and paradoxes of globalization By juxtaposing these regions, we intend to question the uses of technology, the concepts dominating its discourses, and its artistic outcome. Specifically, our concern is to bring the issue of culture into a world context. 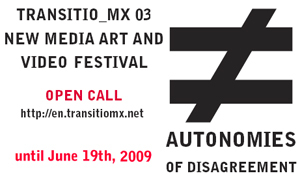 In order to support, acknowledge, and promote current research and production in new media art, Consejo Nacional para la Cultura y las Artes through its Centro Multimedia of the Centro Nacional de las Artes calls the local and international artistic community to the Third New Media and Art Contest. The contest is open to any individual, group and association engaged in the production of artwork created with new media technologies, including video art, sound art, net-art, installation, composition, performance and related disciplines. Residual topography: This category seeks to reveal the discourses pronounced by means of obsolete technology (electronic and digital) and those articulated when contrasting local technologies with high technology appropriations. It is open for installation; interactive, immersed or sound environments; robotic art; hardware hacking; circuit bending; physical computing; site intervention; or any other related disciplines. A single prize will be awarded worth $50,000 (Fifty thousand Mexican pesos). The Jury will decide the honorable mentions granted. Unusual displacements: the scope of the moving images: In order to analyze the moving images technological reconfigurations (and/or its possibilities) and consider its unusual territories, this category is intended to welcome artworks that use moving images in any of its modalities, be it lineal presentation or interaction: single channel video, 16mm, live cinema, Vj´s, videogame, mobile video, interactive animation, augmented reality, or any other related disciplines. A single prize will be awarded worth $50,000 (Fifty thousand Mexican pesos). The Jury will decide the honorable mentions granted. Dissident territories: the emergence of technology: In order to explore technological developments that differ from industrial ones, this category looks for research and technology development projects who seek for innovations in the use of digital tools and electronic circuits with expressive and experimental means: free hardware and software, bioethical technology, gadget development, applications, devices or any other related disciplines. A single prize will be awarded worth $50,000 (Fifty thousand Mexican pesos). The Jury will decide the honorable mentions granted. Concealed order: viral construction of web contents: This category will welcome those works whose poetics distinguish or surpass conceptions regarding mobile interfaces and information networks. Those that bear important contributions on distribution, expression and collaboration will be more privileged: internet, bluetooth, GPS, radiofrequency, mobile telephony, infrareds or any other related disciplines. A single prize will be awarded worth $35,000 (Thirty five thousand Mexican pesos). The Jury will decide the honorable mentions granted. All works must be submitted after this notification and no later than June 19th at 15:00 hrs. Works postmarked after the application deadline will not be considered. The submission date will be considered only if artworks are sent thorough express mail, not through ordinary mail. Submissions must clearly indicate the category they belong to. International submissions must be clearly labeled as “Material cultural sin valor commercial”.